We are pleased to announce that Mr Ha Tien Manh, Researcher at the Vietnamese Academy of Forest Sciences (VAFS), has been awarded the prestigious Crawford Fund Fellowship for 2018. The Fellowship was established in 2002 with the generous support of Dr Brian Booth AM FTSE to provide further training to scientists in agriculture whose work shows significant potential. Mr Manh, who will arrive in Queensland in May, has recently commenced his PhD through the VAFS. Mr Manh’s PhD thesis addresses the process of solar-kiln drying of Acacia Mangium timber. Acacia Mangium is Vietnam’s most prominent plantation material, making up approximately 50% of plantation estates. Currently, kiln-dried timber boards sell for 28% more than un-dried boards, resulting in kiln-dried timber production being more profitable for plantation farmers. However, as solar-kiln drying is a relatively new technology in Vietnam, Mr Manh’s research will help to improve the efficiency and profitability of drying wood using this method. During his tenure at VAFS, Mr Manh has researched ways to improve the processing and manufacture of forest products. He has collaborated on a number of processing projects for products such as mangrove wood, plantation eucalypt, acacia species and bamboo. Mr Manh has also authored and co-authored seven publications resulting from the research and projects he has collaborated on at VAFS. Mr Manh’s Fellowship Award will see him gaining expert knowledge in solar-kiln drying under the guidance of Dr Adam Redman, Senior Research Scientist from the Queensland Department of Agriculture and Fisheries (QLD DAF). Dr Redman nominated Mr Manh for the Crawford Fund 2018 Fellowship after they worked together on a previous ACIAR project, ‘Enhancement of production of acacia and eucalypt peeled, and sliced veneer produced in Vietnam and Australia’ (FST/2008/039). Dr Redman identified Mr Manh as a “bright and highly motivated young researcher striving for scientific greatness”. “The Crawford Fund Fellowship award will equip Mr Manh with the necessary expertise to improve wood drying in Vietnam,” said Dr Redman. 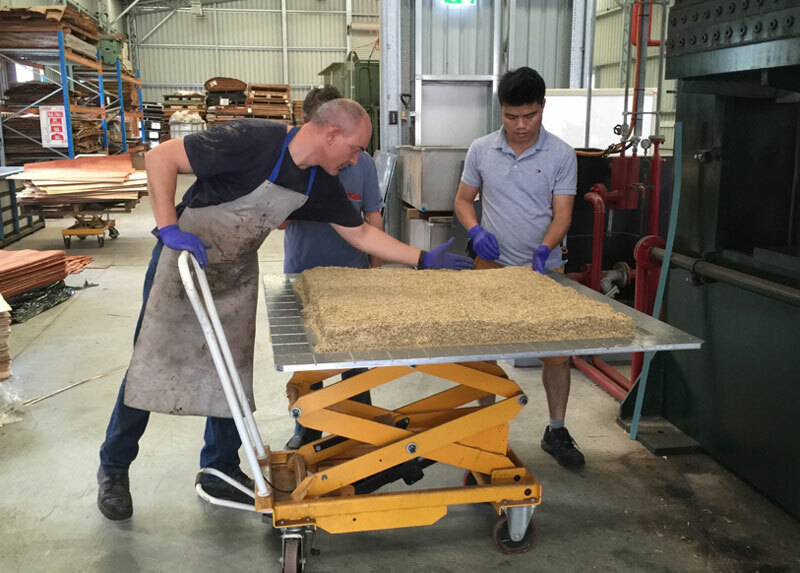 The 8-week training program at the DAF Salisbury Research Facility in Queensland will combine theoretical training with hands-on experience in drying Acacia Mangium timber using a solar-kiln. The training program will focus on developing techniques and methods for determining the moisture gradient of Acacia Mangium timber during drying, and for determining the key wood properties for mathematical modelling such as permeability, diffusivity and wood sorption isotherms. Theoretical training will focus on the mathematical modelling of the moisture movement of Acacia Mangium timber during the drying process. “As kiln drying adds value to the end product, Mr Manh’s Crawford Fund Fellowship training will improve the profitability of small and medium enterprises by an estimated 25% through selling low-input energy kiln-dried material,” said Dr Redman. At the conclusion of the training program, Mr Manh will return to Vietnam to shares his expertise with plantation farmers and his colleagues at the Vietnamese Academy of Forest Sciences.